The once months-long window between when Model 3 orders were placed and the time that these vehicles were delivered has collapsed. What once was an "exclusive" sounding waitlist is turning into a "department store closeout" style effort by Tesla to deliver whatever Model 3s they can as soon as possible, according to a new report by Electrek. Even the pro-Tesla blog was forced to conclude that Tesla may be "trying a bunch of new delivery methods in order to push Model 3 deliveries higher by the end of the quarter", suggesting that much of Elon Musk's bizarre behavior in recent weeks may have been due not to supply bottlenecks but an unexpected drop in demand. The report comes just hours after Tesla hosted a "delivery event" at its Fremont factory. This event was offered to Model 3 buyers, offering them an "exclusive" chance to pick up their vehicle at the factory. It also substantially cuts down on the amount of work and resources Tesla would need to deliver these vehicles to their respective owners. "Tesla apparently made a large batch of Model 3 vehicles with popular configurations and it is trying to match them to custom orders from local buyers," an article from earlier this week states. 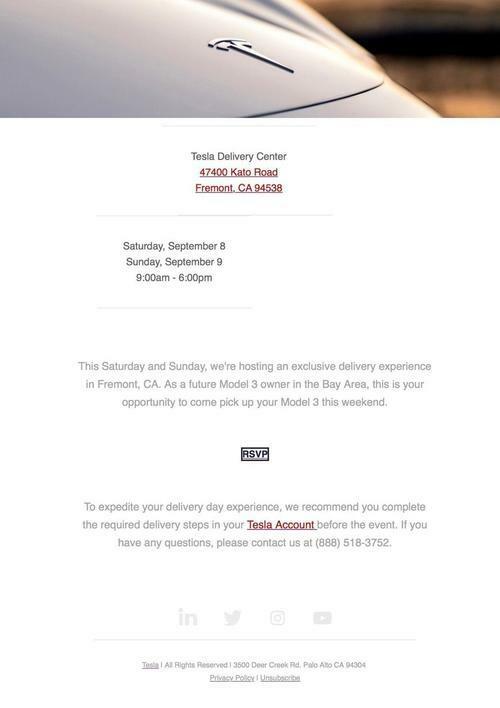 Now, Tesla is taking their delivery proactivity one step further: they are offering "immediate delivery" of Model 3s on a first come first serve basis. It was also reported that the company was sending out emails to Model 3 reservation holders who have been in line since day one, trying to entice them to come in and take delivery of vehicles that are apparently sitting around with nowhere to go. In other words, Tesla appears to be dealing with the "leftovers" from batch productions and trying to entice reservation holders to take a vehicle that they may not have ordered or want, to help them move stagnant inventory. Additionally, according to the report, many of the people that received this email from Tesla are people who have been waiting for the $35,000 version of the Model 3. 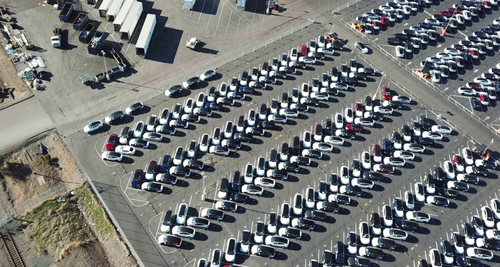 This follows a report that we posted last month highlighting that Tesla's bottleneck had ominously gone from production to delivery, or from supply to demand. And while Tesla can ultimately control supply - at a cost - it now appears to have little control over coolness demand. A report from late August by Electrek had claimed that the company was having trouble dealing with the "insane workload" of Model 3s that it was producing. The "insane workload" as it was called in the title of electrek's report is then referred to as just "gradually improving" production in the story's lede. With these new "aggressive" strategies and delivery events, even the Tesla friendly blog is forced to admit that they "can’t see how this doesn’t result in longer delays for some Model 3 buyers waiting for their cars." But more importantly, we ask: is the "people's electric car" - the $35,000 Model 3 - ever going to happen? The key takeaway from their own story eludes the staff at electrek, however (surprise). It appears that this could be the strongest signal yet that supply could be at the very beginning stages of exceeding demand for the Model 3. If demand has dwindled enough that Tesla is now starting to become urgently proactive in trying to get people to take deliveries of its supply glut, the push for record numbers out of the company could be short-lived. As a reminder, yesterday we reported that Tesla had put out a blog on Friday claiming it was "about to have the most amazing quarter in [its] history, building and delivering more than twice as many cars as [it] did last quarter". This will most certainly not happen if demand has plateaued, or worse, is shrinking.